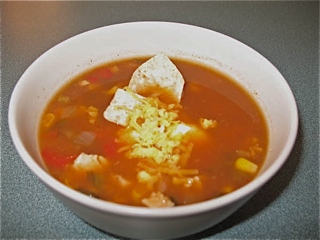 This easy soup is absolutely delicious by itself or served with tortilla chips, cheese and sour cream. Either way we eat it at least twice a month in the winter. I got it from Ellen, but since I make it more often, I got to put my name on it. Try it – you’ll see! In 2-quart saucepan I simmer water and chicken until chicken is cooked through. Remove chicken breasts; cut into bite-sized pieces and return to water. Add chicken broth and chili powder. Bring to boil; simmer, covered for 10 minutes. Add drained corn and salsa. Simmer, uncovered, for 5 minutes. Serve with chips and cheese on top. Excellent with corn bread. I like to add one can of black beans (drained and rinsed) to this recipe. Then I make some cheese quesadillas for the side. A quick and easy dinner that everyone likes!